Some days the best thing you can do for yourself, your spouse, and marriage is to go spend time basking in God’s presence (and take some l-theanine or sepia ). Seriously! Some days it is just hard to be loving, which probably means you need to go and spend time with The Father. When you spend time loving on God and letting Him love on you, you come away from it and are a much nicer person. If you are listening to the right worship music, you can feel changes being made in your heart. You can feel your attitude being adjusted and if you spend enough time in worship, you will behave differently when you come back out. I have had to do this at different times. There were times I would go into my bedroom, shut the door and just worship God. Just me and Him, loving on each other. I would come out of my room a much nicer, happier woman. Yesterday I had one of these moments. I realized that I was just not really being me, the person I really am. So I finally got a clue and got out my phone, pulled up the YouTube app, and put on some music that I know helps me enter into worship quickly. I put on my headphones and turned the volume up all the way and laid my head back and worshiped God and let the Holy Spirit wash over me. I could feel change beginning immediately this time. Sometimes it doesn’t happen quickly and takes a while for me to break through the ‘funk’ that is my attitude, sadly. 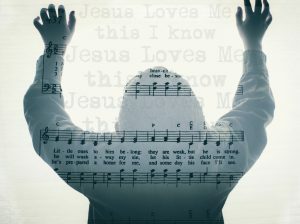 But if I continue to listen to worship music that leads me in worship of God, I eventually come away in a much better mood. So if you are feeling challenged with situations and tempted to have a bad attitude, I suggest you get alone, put on some music that helps you enter into worshiping God, and spend some time with Him. And it doesn’t hurt to ask for His help, either. This is the song I put on because it is what is currently ministering to me/helping me enter into worship of my “Good Good Father”. Then I listen to this one by the same group: “This Love”. I hope you enjoy them and the next time you feel unlike who you really are, you will get alone with God and spend some time in worship and prayer, before you say something you will regret.